Whether you are drawn to the Kate for a love of the performing arts or of Katharine Hepburn, we hope that each Kate experience is a great one. 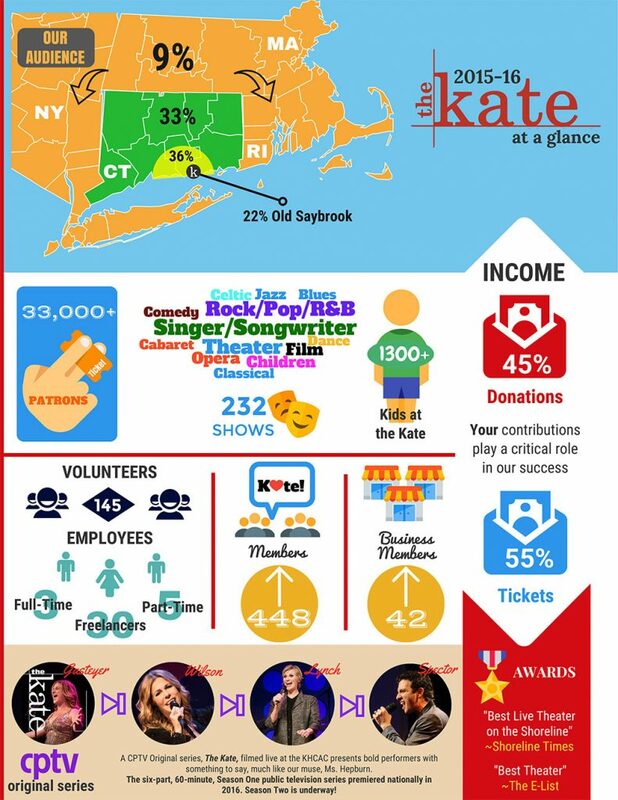 Like many not-for-profit arts organizations, ticket sales alone make up only 65% of the Kate’s operating costs each year. The generosity of our donors and Members allows us to keep doing what YOU love – presenting dynamic and entertaining performing arts on the shoreline. As a patron, you help keep the arts alive in our community. Through a donation or Membership, you can increase your impact by supporting the Kate and Membership offers several special benefits designed just for Members. Your contributions play a critical role in our success – Donate Now! Become a Member and enhance your Kate experience! Download instructions for transferring a gift of stock. Please join us in support of quality performing arts in our community! Consider a gift to the Sound & Vision Campaign! We’ve just crossed the $60,000 mark, bringing us much closer to our $150,000 goal. But, you can still make a difference and contribute to the Sound & Vision Campaign – your support will help shape and elevate the Kate experience! Donate today. How else can you support the Kate?